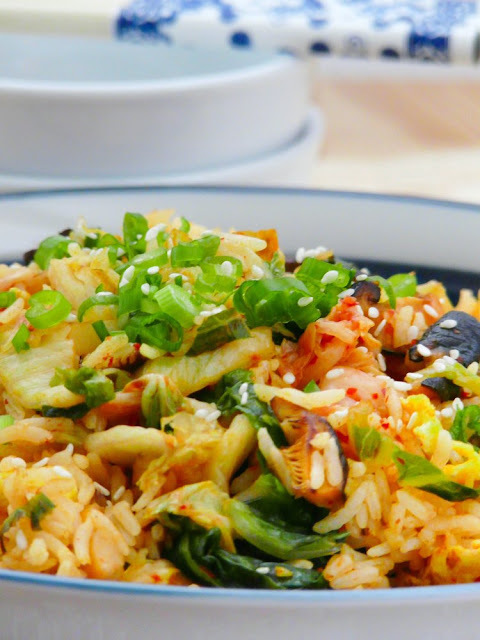 Kimchi is a spicy, fermented vegetable dish (usually made with Napa cabbage) and is served with almost every Korean meal as a side dish or as part of a main dish like soup or stew. In Southern California, it's available in small jars in most American grocery stores, albeit priced a couple of dollars more than what they would actually cost at an Asian or Korean grocery store. It's even available at Costco in large family-sized jars. While I do enjoy the Cosmos brand that Costco carries, I much prefer the house brands sold at the Korean grocery stores like HK Market or the little mom and pop Korean mart located in Arcadia. One day I hope to muster enough courage to try making my own kimchi at home but for now, I'll contend with the store bought versions. Kimchi is also available for purchase online, should you have a hard time finding it at your local grocery store. 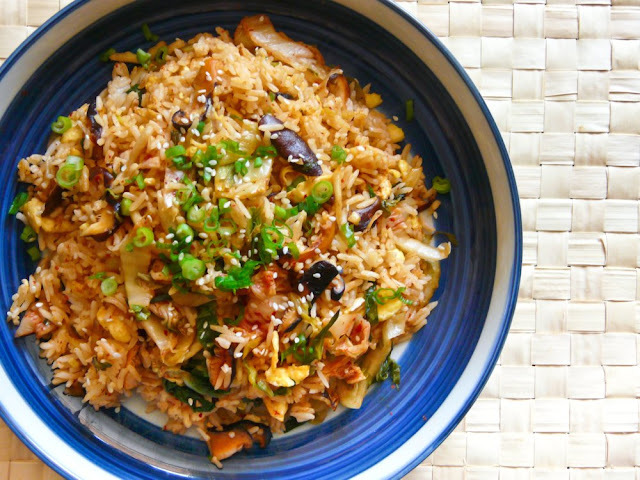 Note: For vegetarians, make sure you read the ingredient list carefully when ordering kimchi as some regional recipes do use fish or oysters. I eat multiple bowls of this stuff when I make it. I made mine meatless. Clockwise from top left: sliced Shiitake mushrooms, shredded kimchi, beaten eggs, minced garlic and chopped green onions. Heat up 2 tbsp. of cooking oil in a wok or large frying pan over high heat. Saute the garlic until fragrant then add the shiitake mushrooms. Saute together for a couple of minutes until the mushrooms have become tender. Push the mushrooms aside and add the eggs to the middle of the pan. 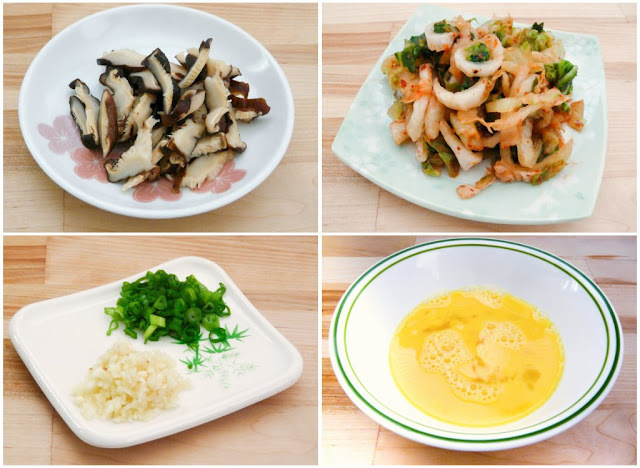 Scramble the eggs then mix it together with the mushrooms. Add the kimchi to the pan and cook everything together for a couple of minutes until the kimchi is heated through. Add the rice to the pan followed by the kimchi juice and soy sauce. Break the rice up as much as possible and mix all the ingredients together. 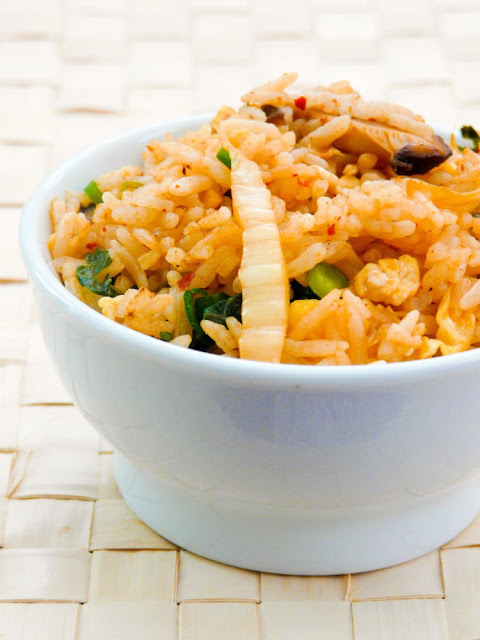 When the rice has been heated through and no longer in clumps, transfer to a serving dish or individual bowls. Top with chopped green onions and a sprinkle of sesame seeds. This recipe is being shared with Midnight Maniac Meatless Monday (MMMM)!